Tickets $30 ($15 UBC Students), available in advance through the UBC Tickets Office at the Chan Centre, or online at tickets.ubc.ca. All proceeds from ticket sales will be donated to CORE INTERNATIONAL (www.core-international.org) and the Nepal Heritage Charity Foundation of BC (http://www.nhcfbc.org/), who are working with community-based organizations in Nepal to fund post-earthquake reconstruction efforts. Pt. Rajeev Taranath is a noted disciple of the great sarod maestro Ali Akbar Khan, and has received wide acclaim for his virtuosic mastery of this lyrical and moving classical Hindustani stringed instrument, earning India’s highest honour for the performing arts, the Sangeet Natak Akademi Award. Based in Mysore, India, Pt. Taranath is also a Ford Foundation scholar and has taught in the music faculty of the California Institute of the Arts in Los Angeles. He will be accompanied on tabla by Abhiman Kaushal, a sought-after concert accompanist and solo performer, and presently serving on the faculty at UCLA. An entering first-year undergrad at UBC, Akhil Jobanputra is a brilliant young talent in the Vancouver classical music scene, having trained since the age of three with Pandit Jasraj, perhaps the greatest living practitioner of the khayal tradition of Hindustani classical music. He will be accompanied by the equally talented and prodigious tabla performer Sunny Matharu, based out of Surrey, BC. For more details on the artists, please visit www.rajeevtaranath.com, www.abhimankaushal.com, and www.sunny-matharu.com. 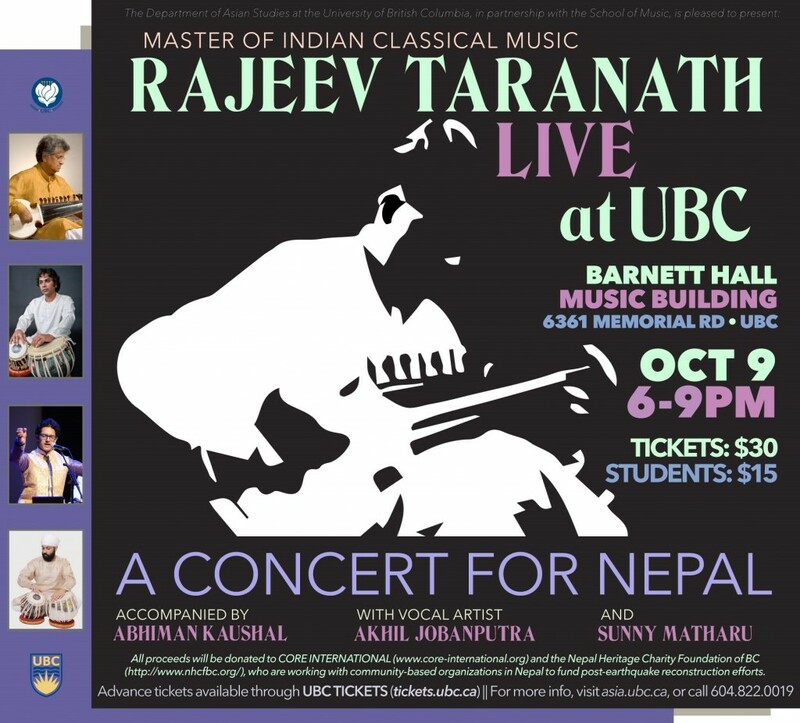 For further information on the concert, please see www.asia.ubc.ca or call 604-822-0019. Proudly presented by the Department of Asian Studies at the University of British Columbia, in partnership with the Department of Music.